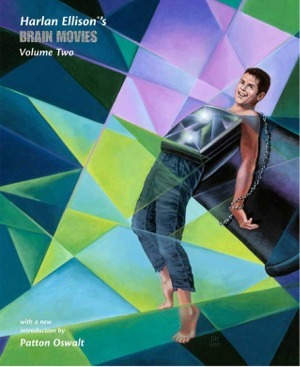 The second in the ongoing Brain Movies series collects six more of Harlan Ellison’s teleplays. Once again, the scripts are reproduced from Ellison’s private files, exactly as he typed them. A new introduction by Patton Oswalt, the voice of Remy in Ratatouille, Grammy-nominated comedian, and author of the New York Times bestseller Zombie Spaceship Wasteland. “Killing Bernstein”—The unproduced teleplay adaptation of Ellison’s chilling short story originally intended for the short-lived ABC anthology series Darkroom. Appearing in an Ellison collection for the first time. “Deeper Than the Darkness” — Ellison’s 90-minute Cimarron Strip teleplay, featuring Jack the Ripper in the Old West, that was famously ruined by the director’s poor grasp of logic. “The Sort of Do-It-Yourself Affair” and “The Pieces of Fate Affair”—Two teleplays from The Man From U.N.C.L.E., featuring Ellison’s original storylines before they were revised for production. These scripts include an editor’s note explaining the scandal that kept the latter episode out of circulation for years. “Phoenix Without Ashes” — The Writers Guild Award-winning pilot script for Ellison’s legendarily bowdlerized science fiction series, The Starlost. See Ellison’s original teleplay — the source of the recent New York Times-bestselling graphic novel — appearing for the first time in an Ellison collection.